But don’t forget, he was just as big in the 50s! But I have to say, I sort of prefer Buddy Holly’s version more. Quoted from Pauly D, on Jersey Shore. Yea… This show is pretty entertaining… Do not deny it. A few mixes, have failed completely. Some actually managed to melt, and slowly drip towards my forehead. Not a good look. Some just didn’t hold my hair in the right places. And others were just soo bad, I had to wash my hair out before I left. 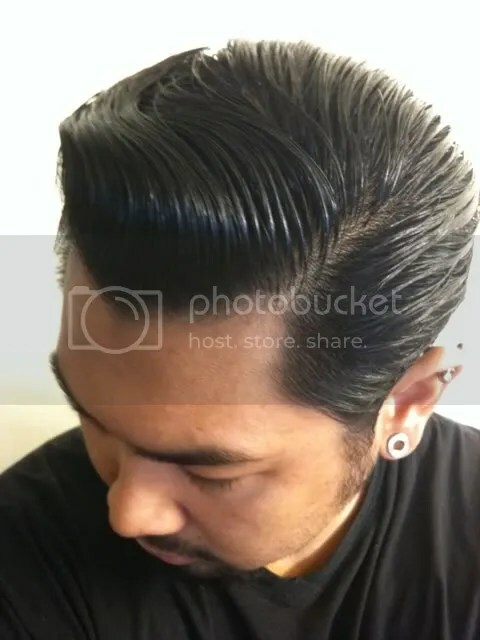 There are many factors I look for, when trying to find a perfect match, when mixing pomades. – If it gives me enough hold. Hold is very important. – If it melts. You don’t want pomade on your skin. It clogs your pores and feels weird. – If it gives me that sheen. Shine is very important, when you’re getting greasy. 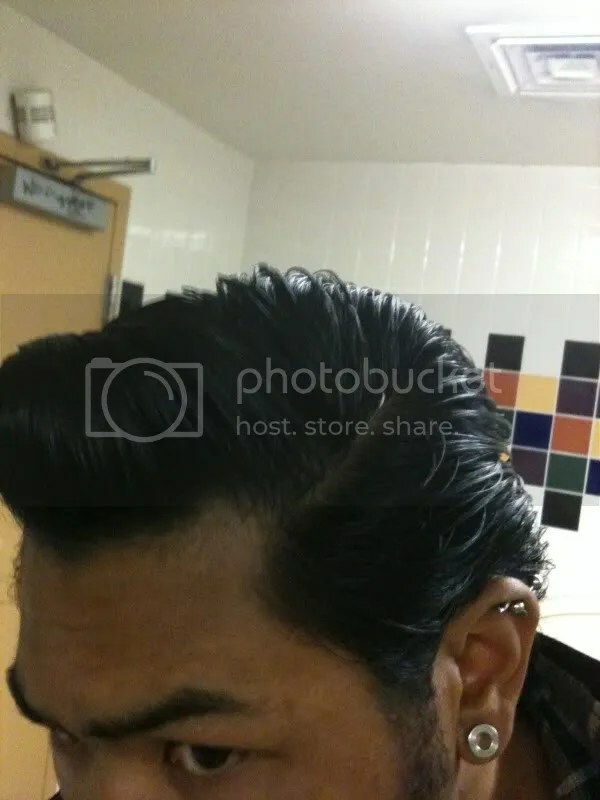 A real greaser pompadour looks greasy. Not flat in shine and height! – If it weighs down my pomp. Too much product will weigh your hair down, and not give you the desired volume. – Slick-a-bility. I like to be able to slick my hair, without losing any volume, sheen, or hold. Sweet Georgia Brown (water based) and Royal Crown (hair dressing) have the most sheen. But they break up the hold of my other pomades, just way too much. Especially during the day, you HAVE to have sheen. At night, it’s a little more acceptable to lose that. Especially if you’ve been drinking that night. Plus, it’s night time. All those neon lights will shine your pomp. As I’ve said, too much pomade will weigh you down. So unless you make your mixes very very meticulously, you’ll end up having too much product in your hair. Today I started off light. A finger tip of Murray’s as a base coat. For me, Murray’s is a good base coat, simply because of it’s hold. Then I did the usual Sweet Georgia Brown mix. Putting Sweet Georgia Brown over the Murray’s breaks up Murray’s slightly, giving you not as strong of a hold, as you would with Murray’s on its own. I didn’t want to put a light coat of Murray’s on top, because it just weighed my hair down way too much, in earlier experiments. So I opted for some DAX. And it was a good choice. It didn’t cover up SGB’s sheen, since DAX on it’s own, has a pretty amazing sheen. It’s light enough to be a top coat, and had decent enough strength to be used on its own. And today was a good day to put this cocktail to the test. Not only was it hot outside, it was also really windy. On my walk, I got hit with winds coming from all angles. The only thing I had to really “fix” was the sides. A quick slicking of the sides and ducktail, and I was good to go. Nothing really moved. and that was a good thing! I think I found my mix, for Viva Las Vegas 14! But with a few more different pomades on the way, the’re will be more cocktails to be mixed. So stay tuned. Past couple of days, these few songs NEEDED to be played, at least once a day. They’re just such great songs. They’ll put you in a good mood, and you can cruise around with these few songs and just enjoy the day. These are only a few, but trust me. There’s a whole lot more. This post has nothing to do with guitars or anything with cars. A popular 1950s hairstyle is the Flattop with Fenders. Personally, this is not my thing. (Even though my barber DID offer to give me one! jokingly. I hope.) Charles Martin Smith aka Terry the Toad, would also agree. 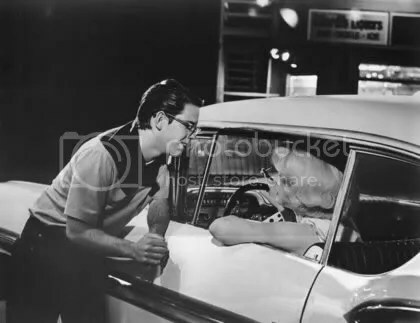 As he had to have his hair cut into a flattop with fenders, for American Graffiti. But for the lads of the 50s, this was cool. The hair cut is pretty simple… A little buzz cut on the top, about a cm or so of hair brushed forward. The front of the hair, was slightly longer, so it would sort of “box” in the hair at the top of the head. Maybe an inch in length. The side aka “fenders,” were considerably longer than the rest. About 3 inches in length! You can only imagine how your hair must have looked, if you didn’t or forgot to style it for the day! The fenders were usually slicked back and the top of the hair, brushed forward. Up close and personal. An unnamed student. Sort of looks like Terry the Toad, doesn’t he? Maybe that’s where George Lucas drew inspiration for the character. 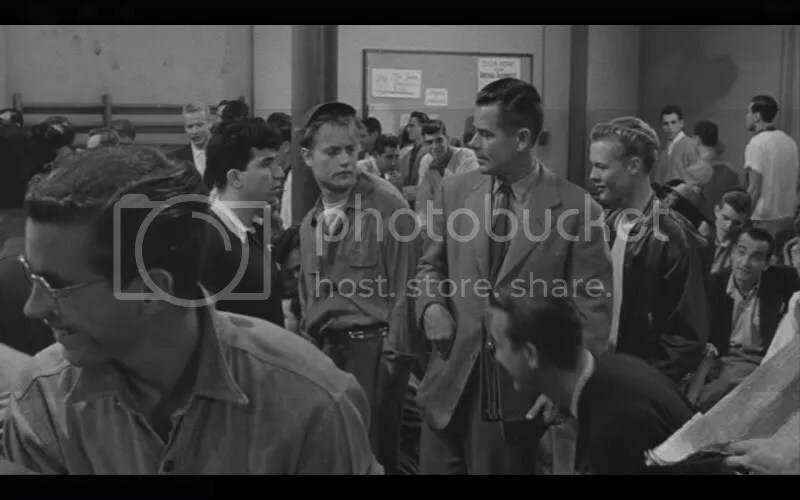 Still trying to identify the hairstyle, from the kid in the back, behind Glenn Ford. Terry the Toad getting smooth with Debbie. I’m pretty sure Charles Martin Smith wouldn’t mind having a flattop with fenders now! Even though I personally prefer a pompadour, than any other 1950s hair style, the flattop with fenders still gets respect from me. Guys back then really cared about their image. And being up to date with the latest hairstyles, was a must. The flat top with fenders is just one of the many hairstyles of the youth in America in the 1950s. But, does it have the longevity like the pompadour? 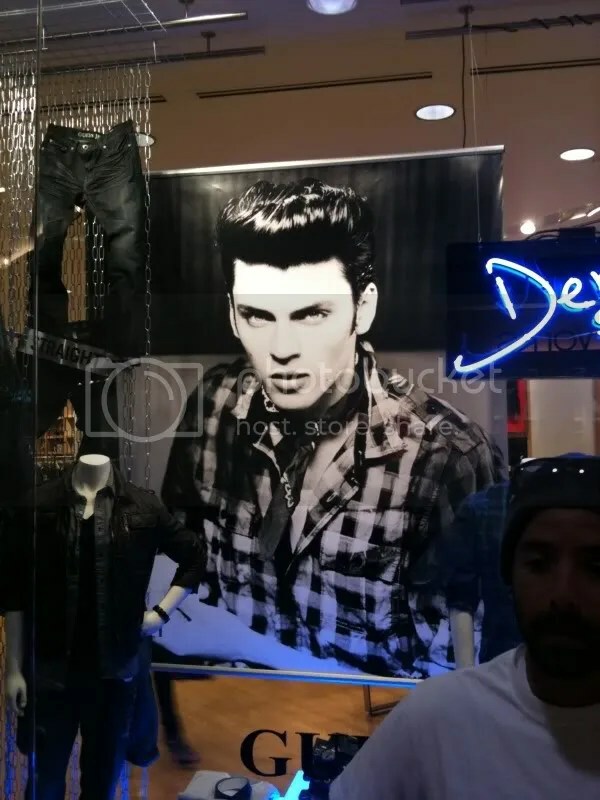 Just the other day, walking through the mall to head to the Apple Store, my girlfriend noticed a HUGE pomp… The store GUESS had a major “greaser” styled model with a big fluffy pompadour. Guess is the most rockabilly store out there! The mannequins were styled with “chambray,” plaid prints and leather jackets. Never been a fan of GUESS, so I ddn’t want to stand infront of this place taking pictures. 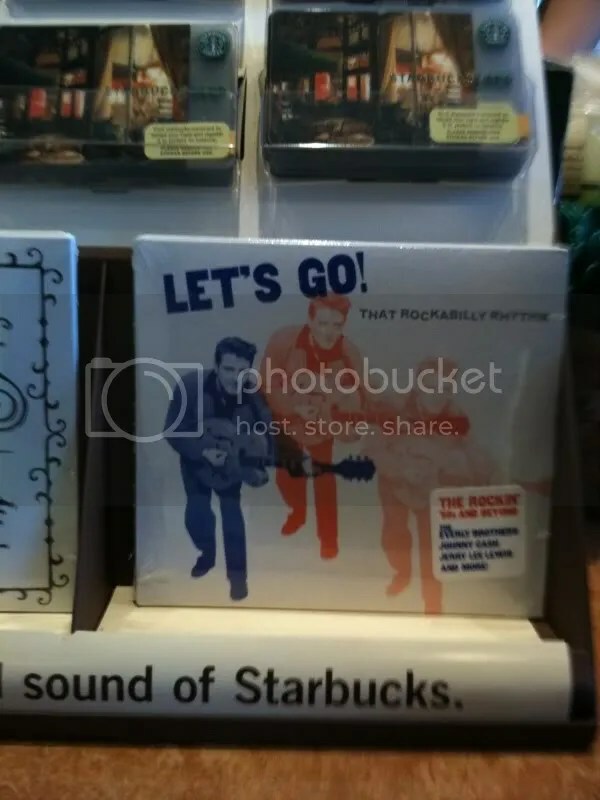 Rockabilly is also at corporate STARBUCKS! Every now and then, I’d take a look at the “cool new” cds Starbucks have. Hey, sometimes they have something catchy! But today we noticed something that pertains to this here blog. EDDIE COCHRAN! Not really, it was just him three times on the cover of “LET’S GO! That Rockabilly Rhythm” Even though they had him on the cover, he wasn’t listed on the front sticker! Not a bad mix of artists, I suppose… Johnny Cash, Elvis, Carl Perkins, The Everly Brothers, and obviously, Eddie Cochran, just to name a few. I already have most of the songs on my iPhone, so there was no need to have this CD. But, if you want to get your taste of good ol 1950s-1960s Rock & Roll, this wouldn’t be a bad place to start. I, personally prefer this era of rockabilly, as opposed to rockabilly of today. But if it’s good music I could tap my toes to, then why not? Here, I leave you all with Carl Perkins – Rockabilly Fever.